Conor McGregor embarks on a revenge mission when he faces Nate Diaz in the main event of UFC 202 on Saturday night. Will McGregor avenge his sole defeat in the Octagon or will Diaz beat the Irishman for a second time and leave no doubts? 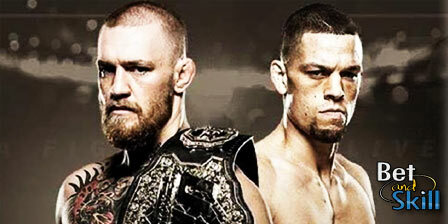 Find below our betting preview on the "McGregor v Diaz 2" fight with predictions, betting tips, enhanced odds, free bets and no deposit bonuses on UFC 202! Conor McGregor’s rapid rise to stardom has been one of the biggest stories in combat sports over the past few years, with his 13-second knockout of Jose Aldo making him the UFC featherweight champion in late 2015. Anyway, the Irishman suffered his first defeat in UFC against Nate Diaz, when the American agreed to fight the Notorious on short notice after Rafael dos Anjos pulled out of a scheduled fight. Going from 145 pounds to 170 pounds, McGregor was simply unable to knock out Diaz, who is used to fighting at a heavier weight. He did make a mess of Nate Diaz’s face in the first round of their fight at UFC 196, but Diaz was able to absorb those heavy strikes that have KO’d the likes of Jose Aldo and Chad Mendes. One thing is for sure: McGregor won’t be taking Diaz as lightly this time around. McGregor is under a lot of pressure to win the rematch and rebuild what could easily become a stagnating career should he lose to Diaz again. He has a largely unique fighting style, where he depends heavily upon unpredictable movement and striking to unsettle his opponents and to also keep their attacks at bay. The Irishman has only gone the distance once—in a bout against Max Holloway in which he tore his ACL en route to victory. That was the only time McGregor has been past the second round. Diaz strikes more than anyone McGregor has fought before and has a strong jaw (only one loss by knockout). Nate Diaz (19-10) shocked the world when, on just two weeks’ notice, he inflicted a first UFC defeat on featherweight champion McGregor, forcing him to tap out to a rear-naked choke in the second round at UFC 196. Diaz has had his ups and downs throughout his UFC career, but he enters this matchup on a high note. The brash Californian defeated top 10 lightweight contender Michael Johnson via unanimous decision in a December contest that was awarded “Fight of the Night”. Furthermore, he has also recorded impressive victories over Donald Cerrone, Gray Maynard, Jim Miller, and Takanori Gomi in his career. Diaz has enjoyed a full training camp this time around while McGregor has assembled an all-star team in a bid to ensure that he will have an optimal cardio. Diaz has the height and reach advantage, and that quickly became apparent in the 2nd round of the UFC 196 fight when a series of power-packed punches left McGregor completely drained. He has good jiu-jitsu skills and is strong in the clinch. His best shot may be to get McGregor into a clinch, take him to the ground, then go for a submission. While Diaz doesn’t have strong takedown defense, that’s partially by design; he has a strong submission game - 12 of his 19 wins have come via submission and four via KO/TKO. "Conor McGregor v Nate Diaz predictions, betting tips, odds & free bets (UFC 202)"